Information for participating artists is available below and can be downloaded here. Welcome to the 67th Annual Villager’s Outdoor Art Show that is being held in the Historic Stockade neighborhood of Schenectady on Saturday, September 8, 2018, from 10:00 a.m. to 4:00 p.m. (rain date: Sunday, September 9, noon to 4:00 p.m.). A special category of “Young Artist” (ages 8-18) is included in the show. There will be separate judging for the Young Artist category. Registration will begin at 9:00 a.m. with a non-refundable fee of $40.00 per individual adult artist or $10.00 per individual young artist. Artists can pre-register using the online or downloadable form on the registration page. For Art Groups, multiple artists displaying with a gallery, etc., a non-refundable fee of $15.00 per individual adult artist, or $5.00 per young artist is required. NOTE: To be eligible for judging of your work for a cash award, a non-refundable fee of $40.00 per individual adult artist or $10.00 per young artist is required. Be prepared for inclement weather. If it is raining at 9:30 a.m., the show will be rescheduled for Sunday, September 10 from noon to four (hour changes are to accommodate area church services). We will post a notice on the website if the show is to be postponed due to rain. If it rains after 2:00 p.m., the show is considered finished and will not be rescheduled. Your exhibit area should be cleared by 5:00 p.m. Original works of fine art (including: drawings, paintings, sculpture, graphics, non-utilitarian textile wall hanging, and photography) may be displayed. Supplementary portfolios containing prints of your original artwork are permitted at your display area. They cannot be in the judging and should remain in the portfolio. We encourage sales. It would be appreciated if your work could be matted and/or framed. No crafts are permitted in this show (includes: sun catchers, furniture, mugs, slate, t-shirts, postcards, bookmarkers, notepaper, greeting cards, jugs, envelopes, etc.). No performing arts are permitted within the boundaries of the show. In order to qualify for your artwork to be judged, you must have an exhibit in the Art Show. Artists must display more than one piece of art work in their exhibit. Award presentation will be at approximately 3:00 p.m. at the Indian Circle. All winning artwork will be on display at the circle. These works will remain on display throughout the afternoon. 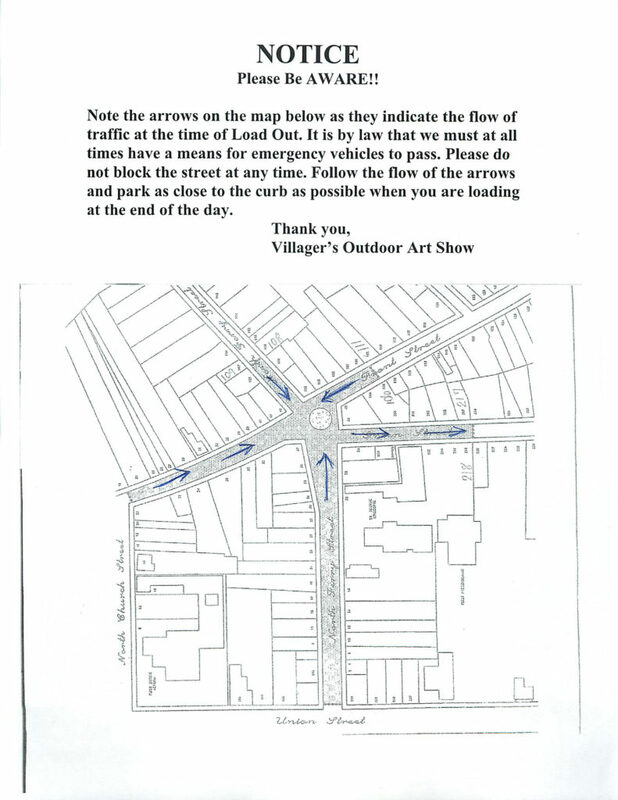 We look forward to seeing you at the 67th Annual Villager’s Outdoor Art Show on September 8th.